Over the days leading up to the 25th of December I’d like to give something to everyone who stops by my blog. These tips cover camera settings and tricks, flash, lighting, software and gear. I’ll be providing a pair of tips each day until 25th December. I like to have separate controls for separate settings. 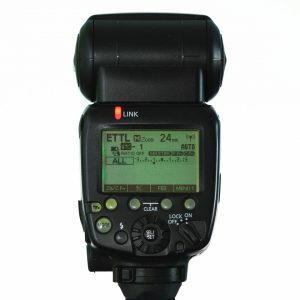 Using a custom function in the Speedlite flash or transmitter I simply turn the wheel on the flash to change flash exposure compensation (FEC). I use E-TTL flash most of the time, and this is my way to change FEC. C.Fn 13 is the right one for the Speedlite 580EX, 580EX II, 600EX-RT, 600EX II-RT, 430EX III-RT and the Speedlite Transmiter ST-E3-RT. Once set, the dial on the flash becomes a flash power override. Remember for many of those Speedlites, you can set C.Fn 13 from the camera menu, that’s what I did using an EOS 200D. Please note that once you set this, there’s an outside chance that you’ll dial in some compensation on your receiving or slave flash, as shown on the second picture above. One way to avoid this is to ensure that the power switch is in the lock position. This one customisation simplifies my life, if I want to adjust the ambient light, then the controls are on the camera. 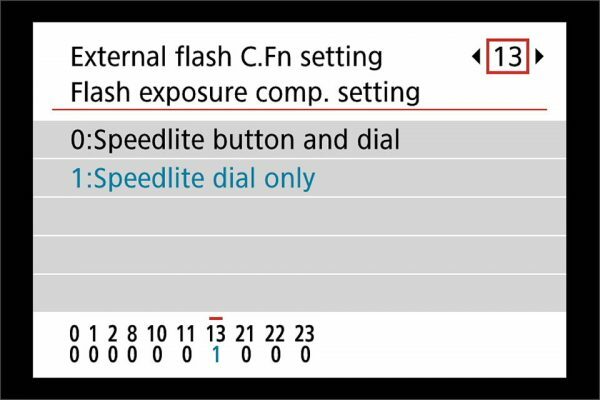 If I want to adjust the flash, the dial on the flash/transmitter is how I do it. 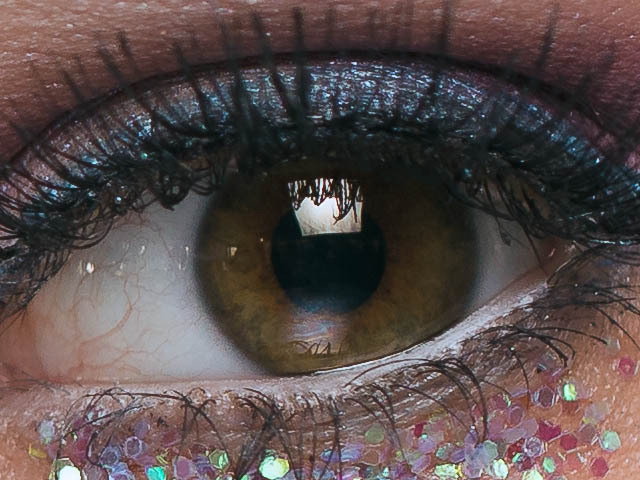 Everybody loves a good wide-aperture portrait, so this is how I’m getting consistent focus on the eyeball. Firstly I set my camera to AI Servo AF, yes that’s the one for moving subjects!, Then I select spot AF if the camera has it, the smallest most limited size AF point possible. You’ll find spot AF on an EOS 6D Mark II, EOS 7D Mark II, EOS 5D Mark III/IV, EOS 5DS/R and EOS-1D X / 1D X Mark II. If your camera doesn’t have spot AF, select 1-point AF. Lastly I move the AF point to the desired part of the frame so I don’t have to recompose at all. 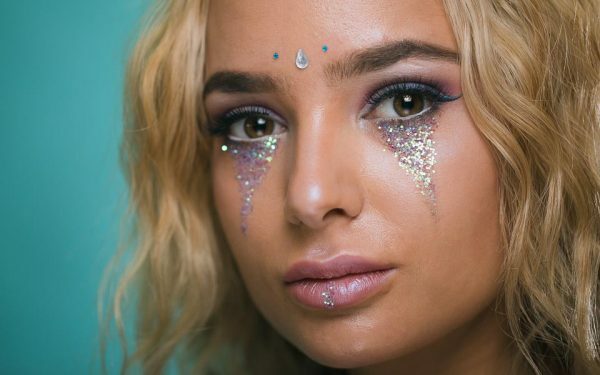 I want the focus on the eyeball, not the end of the eyelashes and certainly not the nose. So I’m tracking my subject for movement, if they breathe or move, or I do, then the camera will adjust the focus to keep the eyeball sharp. That is a 1-2-1 size section of the picture of Emma, at the top. I cropped a 640 x 480 pixels out of my shot. As you can see the tips of her eyelashes are out of focus, but I’m 100% sharp on the eyeball. I used the EF 100mm f/2.L Macro IS USM lens at f/2.8 for the shot. You can see the square Lastolite soft box reflecting in the eyeball too. All the EOS cameras can be setup with only a single AF point as long as you’re not using full automatic – green square – mode. 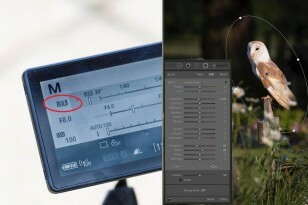 Use this single AF point if you don’t have spot AF mode, but make sure you are on the eyeball, not the eyelashes as the focus system is designed to focus on the closest object.